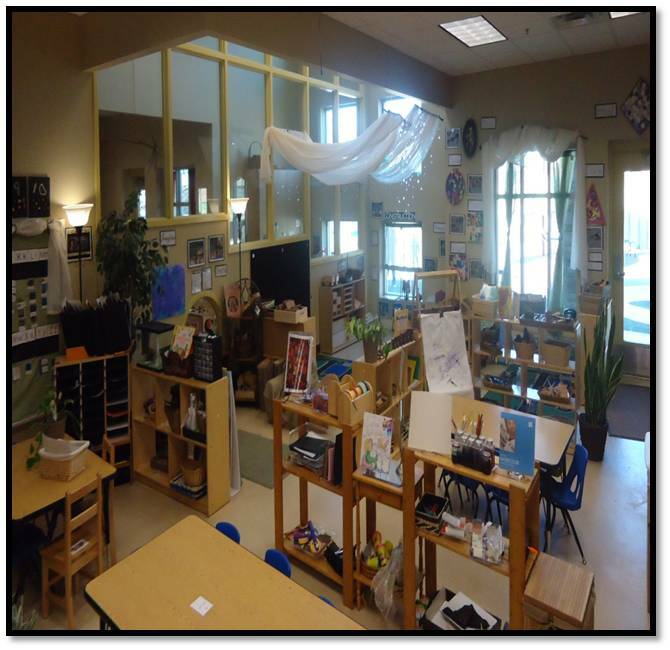 When we began changing our environment from a traditional classroom environment to incorporate Reggio Emilia design principles. We asked many questions!! 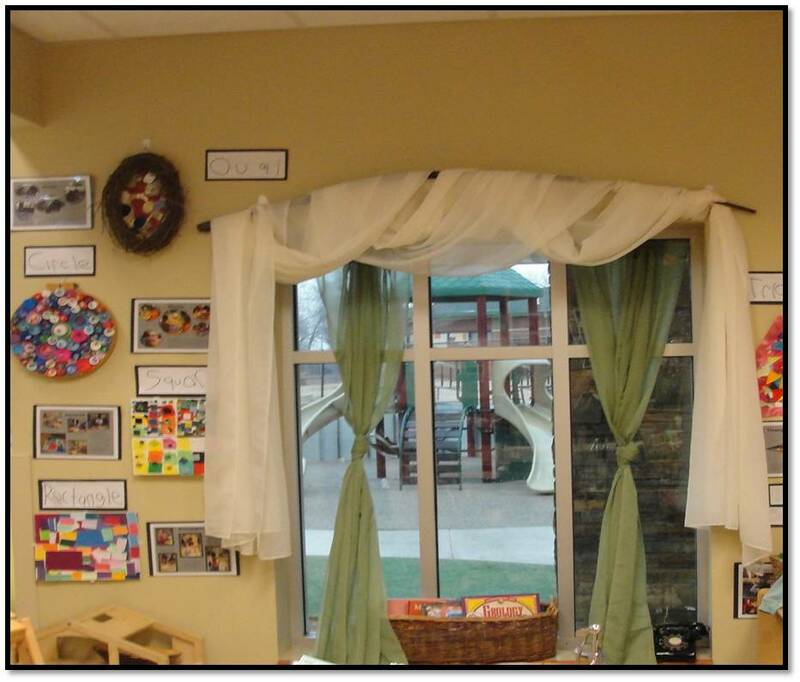 What goes into building a preschool room? 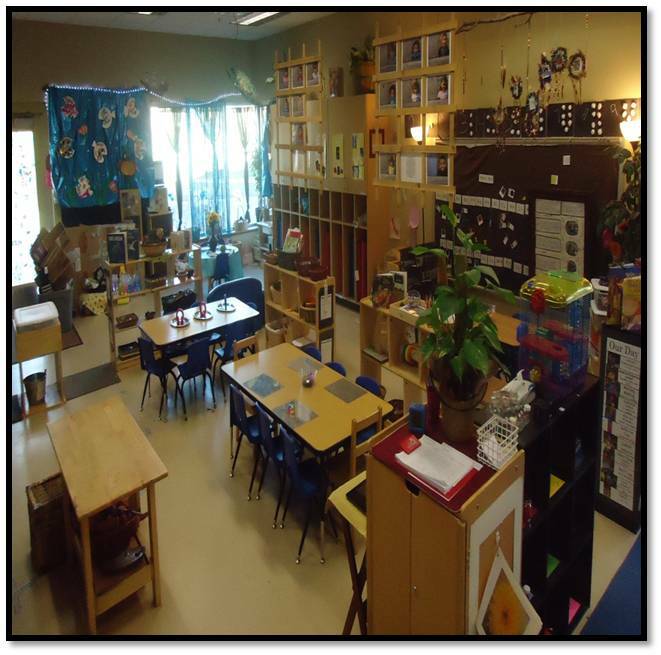 What goes into making two separate preschool rooms a cohesive community? What does the room feel like when you enter? What elements are important in the classroom? What are the teacher's language? We came up with our answer. 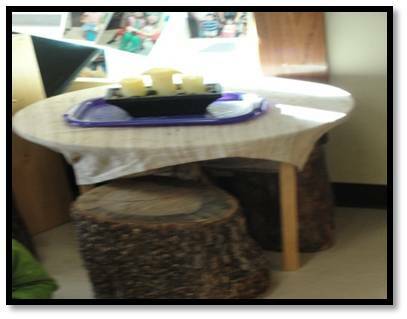 created centers for large groups, small grouping areas, cozy areas. give them multiple opportunities to explore and create. Developing a classroom that has two rooms with connecting hall way and bathrooms was easier than I had ever dreamed. We have observed that sharing classroom develops a larger sense of community that provides many opportunities to collaborate with other students that share interests. 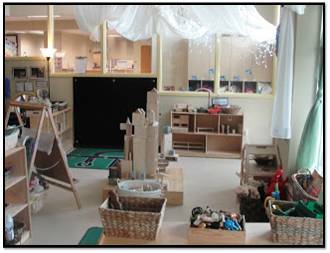 The block area was doubled for the children to have ample room to create, explore, and build. We added a stage and an easel in the construction area. 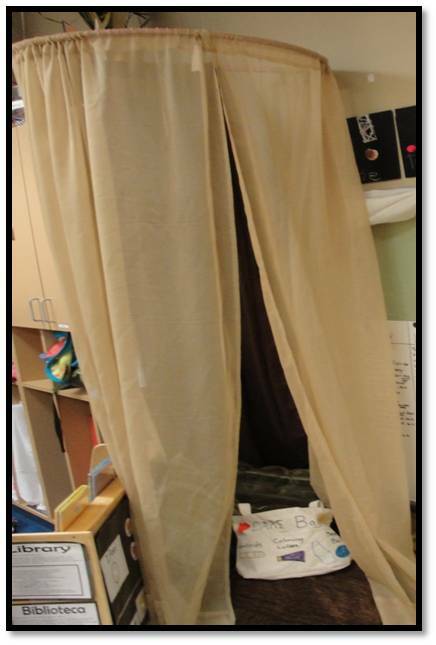 The stage allows the children to leave projects for an extended period of time. The easel allows the children to draw up plans on large paper and adds more creativity to the area. The materials are repurposed, natural, or recycled. We do add some traditional materials do to DHS and ECERS requirements. We are always on the look out for authentic materials to replace the traditional materials. We were able to put a large easel in an area for the children to paint. The children collaborate and work together to make murals or individual work. 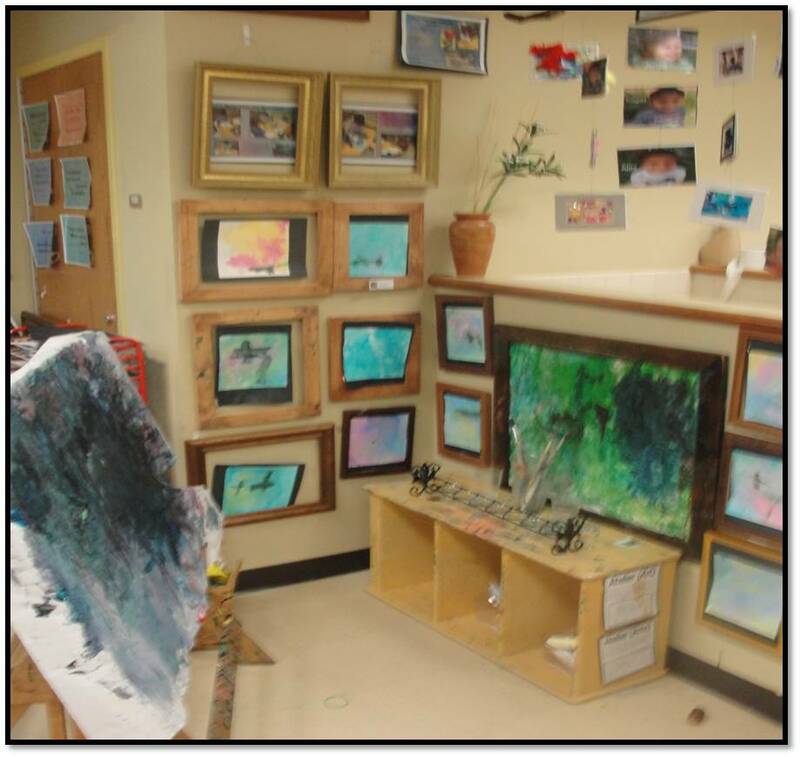 The frames and documentation gives children knowledge that their work is important. The music area was a joy to put together. 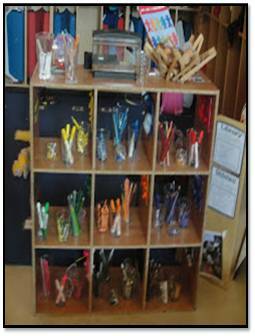 The ability to put together authentic instruments in an open area for the children to explore. I work with children that are in a low-social economic situation and may have never been able to touch a real instrument. 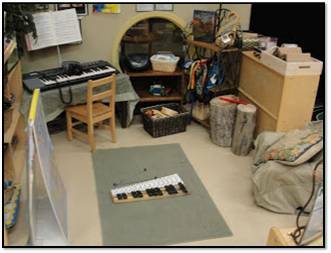 Music is being forgotten in many schools but if we are to find each child's language this is one area that needs to be available to child all day.The stumps are used as drums. Thee writing center has many different types of writing tools. The crayons(variety of sizes), markers, pens, colored pencils, chalk, and pastels are organized by color. 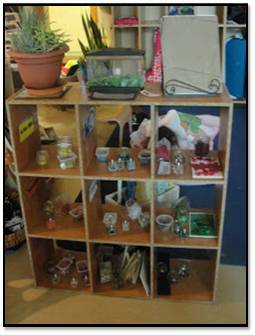 The collage center was created with open shelves. On each shelf materials are organized by colors. 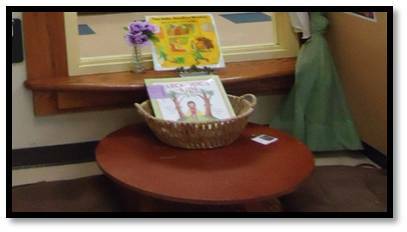 We have several areas that are for a small group to work and explore. The table has water and light. The children were exploring light in water. The table is about six inches off the floor and the seating is chair cushions placed on the floor. This are is being used as a author study table. We each have an area that is a one person center. We use the terminology safe zones. 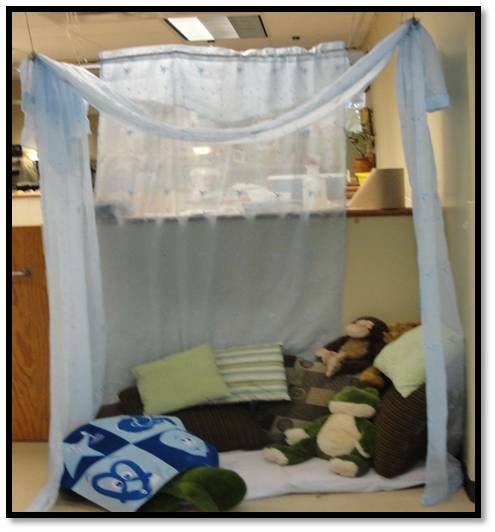 The areas allow the children a soft area that they can go to when they need time away from others. This allows children to learn self regulation. The larger one has a crib mattress, pillows, and stuffed animals. The fabric around the area provides some privacy. This safe area has a cushion that is a rectangle about foot thick. The material is on a hula hoop. We have a care bag in each area that contains lotion, family pictures, kaleidoscope, squeeze balls, and a special stuffed animal. I am really happy that I am starting this blog. It will be a great reflection tool for me and I hope it helps teachers begin their journey in changing their environments.